At a far edge of alleged Catholic supernatural phenomena are cases in which it is claimed that a colorful glittery material has materialized in some places on particular people or at poignant times like some sort of manna. Is it a hoax? Is it demonic? Is it a strikingly unusual move of the Holy Spirit? Your consideration is as valid as ours. Glitter was reported on the face of Maria Esperanza, the mystic associated with that site. The substance accompanies or follows lacrimation (weeping) — or so it is claimed. 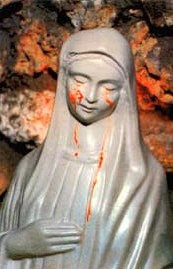 At Fatima, however, the “glitter” was immaterial and dissolved into thin air — more a luminosity. 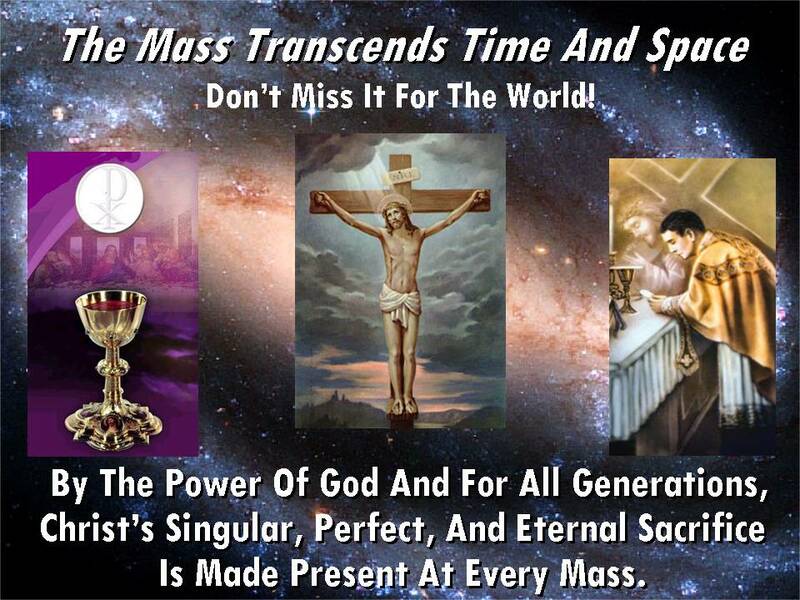 The Mass is a sacrifice because Jesus, the one time, once for all, holy sacrifice for the sins of the world becomes truly present for us there, on the altar. Why have sacrifices pretty much died out everywhere, yet it remains within Catholicism? Because the cross of Christ is the “one, full, final sacrifice”. 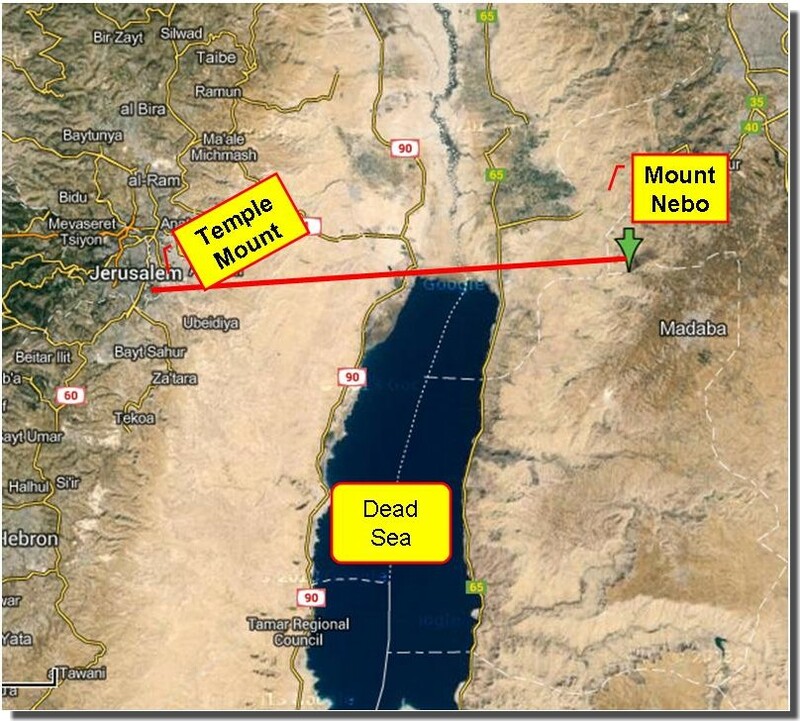 On the cross the sacrificial systems of the world were fulfilled. All was completed. The Mass is the daily remembrance of that one, full, final sacrifice. Through the mystery of the Mass we bring that completed sacrifice into the present moment and apply it’s graces to our needs today. The popes of the past century have recognized this assault and spoken of it in prophetic terms encouraging the Church to read the signs of the times in the light of its eschatological journey towards the new heaven and new earth. A decisive moment in the spiritual combat was when the Blessed Virgin entered into the battle fray in the nineteenth century with her apparitions at Rue du Bac in Paris, and thereafter at La Salette and Lourdes in France, and in many other places all around the world, some of which still await the approval of the Holy See. 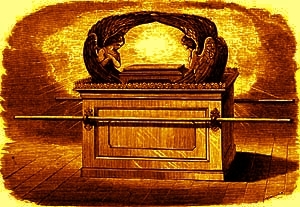 These supernatural events could, in a sense, open the pages of the Book of Revelation with more clarity, as in chapter twelve, narrating the confrontation between the “Woman clothed with the sun, with the moon under her feet, and on her head a crown of twelve stars” (12:1), and a “great red dragon” (12:1-17). 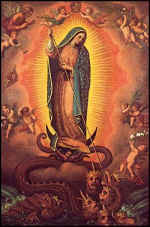 It is the same Woman mentioned in Genesis when God cursed the serpent saying: “I shall put enmities between you and the Woman, between your seed and her seed: she shall crush your head” (3:15). Mary is, indeed, the Woman of Genesis and the Woman of the Apocalypse. The Marian era that is reaching its climax now is shrouded in the mystery of Divine providence. Been there. Done that. I completely agree. Thinking back, the night after the crash was something altogether. Knowing I had dodged a large bullet, I sat alone in my quarters, a bottle of whiskey in my hand; the booze seemed like the manly thing to do. I hadn’t changed out of my bloody flight suit and was draped in an easy chair. The Doobie Brothers were concert loud on my cheap stereo and I kept reliving all my thoughts during and after my 160-foot joyride. Then I picked up the phone and called my mother. The urge to call my mother was primordial. I was seeking comfort where I first learned of it. From her. Listening to the sound of her voice was heaven. Absorbing her love launched a gusher of emotions. I was so spectacularly happy to be alive that nothing could have dampened my spirit. I was able to find peace that night, nourished by the love of my mother and the realization that I was given the gift of tomorrow. Back then, I was not a spiritual man. Not for a moment would I have considered dropping to my knees or going to church to give thanks to God. Never would I have presumed God saved my life either. You see, God didn’t exist in my universe. However, today, as a Catholic who has been on an incredible journey of discovery, I don’t think I was lucky. I don’t believe in luck. No, something else was at work. Divine, mysterious providence. I know it. Better men than I suffered untimely and tragic deaths. My own life hasn’t been an exemplary one. Yet God spared me. But why? And what for? 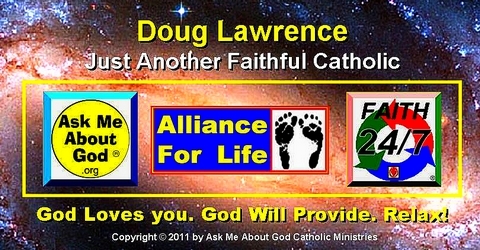 Puffed up atheist hopes to “educate” ignorant Christian fundamentalists. Atheist Susan Jacoby scours the world for religious extremists, carefully noting their obvious errors, and then dutifully attributes those erroneous beliefs to all people of faith, everywhere. Then, using her “magic education bullet” she offers secular atheism as the only obvious solution for all the ills of the world. Jacoby’s own, limited, secular education has failed to equip her with the ability to understand people of faith, let alone authentic Catholicism, which is grounded not only in faith and reason, through the world’s oldest, most inclusive, and most successful tradition of genuine academic and theological scholarship … but also in the literal, historical person of Jesus Christ, who claimed to be God, and then went on to prove it, by raising himself up from the dead. Jacoby uses statistics to support her position, which essentially describes an inverse relationship between education/intelligence and religious faith. 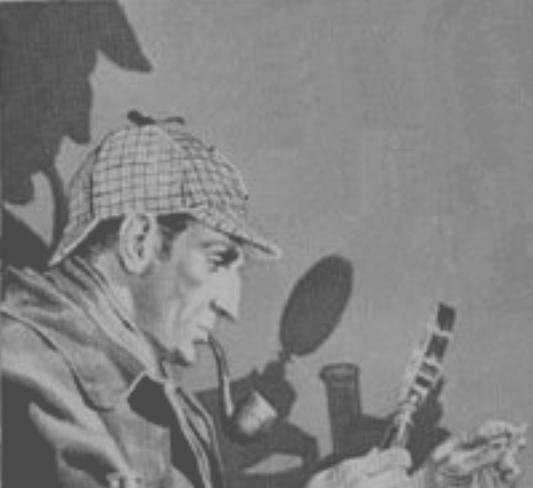 Then, she attempts to conveniently redefine the term, “mystery” in order to strip it of any true meaning. In this, the woman definitively proves that she doesn’t know what she doesn’t know! Ms. Jacoby, Catholics are taught to know the difference between things that are merely not yet understood, and things that will forever remain beyond human comprehension. For us, there is no real conflict, because our faith informs us that knowing God, we will also one day, know the heretofore unknowable. In the mean time, we Catholics take great joy in such things, and even put them to a very practical purpose. Taking the word “sacrament” in its broadest sense, as the sign of something sacred and hidden (the Greek word is “mystery”), we can say that the whole world is a vast sacramental system, in that material things are unto men the signs of things spiritual and sacred, even of the Divinity. “The heavens show forth the glory of God, and the firmament declareth the work of his hands” (Psalm 18:2). The invisible things of him [i.e. God], from the creation of the world, are clearly seen, being understood by the things that are made; his eternal power also, and divinity” (Romans 1:20). The redemption of man was not accomplished in an invisible manner. God renewed, through the Patriarchs and the Prophets, the promise of salvation made to the first man; external symbols were used to express faith in the promised Redeemer: “all these things happened to them [the Israelites] in figure” (1 Corinthians 10:11; Hebrews 10:1). “So we also, when we were children, were serving under the elements of the world. But when the fullness of time was come, God sent his Son, made of a woman” (Galatians 4:3-4). The Incarnation took place because God dealt with men in the manner that was best suited to their nature. The Church established by the Savior was to be a visible organization (see CHURCH: The Visibility of the Church): consequently it should have external ceremonies and symbols of things sacred.